The following is a transcript of True Mother’s message given at a meeting with leaders of Family Federation for World Peace and Unification’s business organizations on March 22, 2013 (Heavenly Calendar February 11 and Year One of Cheon Il Guk) at the Cheon Jeong Jung. These notes are an unofficial translation from a video posted on FFWPU-Korea’s web page and should not be considered authoritative or quoted in any publication without prior permission from FFWPU. 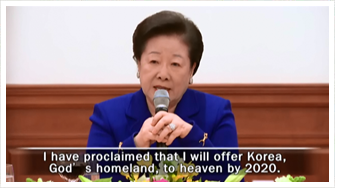 “I have proclaimed that I will offer Korea, God’s home, to Heaven by 2020. To achieve this, your active responsibility and cooperation is essential. Organizational headquarters can be compared to the mind and body. If the church organization pertains to the mind, the business organization corresponds to the body. The body and mind cannot be separated. They must become one, right? Therefore, the headquarters and the Tongil Foundation organizations must become one. The body should be healthy. To actively support the work of the mind, the body must be strong, work hard and complete all of its responsibility. By doing so, an individual, church, society, nation and world can have a healthy body and mind. “From such a perspective, I am about to give everyone the chance to do your very best. One of the things I want most to achieve before 2020 is building a museum of True Parents’ lives. Did you, or did you not, meet the Returning Lord after the long wait of 2,000 years? Now, not much time is left until they [people who have yet to meet True Parents], too, come to know this truth. They will recognize that they can no longer develop based on the ways and teachings of the past. “Looking back on Father’s ascension, we, the Unification church, did not do enough to spread the good news to the world even though the great day mankind and heaven had been long anticipating (for 6,000 years) had truly come about and the Savior, Messiah, the Lord at his Second Coming, the True Parents conducted the many providences on earth. This is deeply regrettable. If we do not accomplish our responsibilities, our descendants will automatically face difficulties. Therefore, you must spread the news while you’re still alive, at all costs, that a new age has begun and the Returning Lord, Messiah and the True Parents came and ascended. “Six months have already passed since Father’s ascension; how much effort have you put into witnessing to new people through your respective responsibilities? The time left until you depart for the next world is shorter than the time you have lived so far. The population of the world today exceeds seven billion. Imagine how people who lived in the same age as us would lament when they go to the spirit world for not having known the True Parents and their message while on earth? In no way could we avoid charges against us such as: ‘Why didn’t you tell me about this even though we lived on earth in the same age?’ If you do not fulfill your responsibilities, your descendants would have to face indemnity again. As most of you have heard and know through study of the Word, Blessed families must fulfill their responsibilities. Thus, I have set the vision: We must restore not only Korea but at least 43 countries on the national level by 2020. The above countries were selected, and impetus has been put toward this vision. I would like everyone to participate in this effort. Maintaining the status quo is not good enough. You must invest all of your sincerity and make sure the companies you’re developing fulfill their responsibilities within the period of grace bestowed by Heaven. That is why you must become companies that can contribute to God’s will. A couple must unite and then witness, of course. In addition, they must fulfill all their responsibilities and help develop their companies. “The only way left for us and our descendants is to succeed. Do not forget this! Do you understand? That is why you must all help in the building of a museum of Father’s Life. This will become a historic museum. It must be known for displays of the highest quality that can be found nowhere else on Earth. This museum will be built in a way that allows humanity vividly to see how much True Parents embraced history and humanity throughout their lives. “You all know the founding purpose of Universal Peace Academy (UPA). A great poet form India, Rabindranath Tagore, praised Korea 150 years ago. What do you think the poet saw or felt to praise about Korea in such a way? According to him, on the day the lamp of truth gets lighted, the lamp will illuminate the world. This poet knew Heaven’s providence. Through the advent of the true owner and the returning of the Messiah in Korea, Korea gets to radiate light. What in history do you think Korea can be proud of? To be able to start this providence with the True Parents is a tremendous blessing for your descendants and ancestors. It’s a grace. However, you must not keep these blessings to yourselves. You must live for the sake of others. Bringing peace and happiness to our neighbors is something we must expand. Thus, it is our mission, as blessed families living in this age, to guide all humanity in becoming people of Cheon Il Guk in front of Heaven which opened the Cheon Il Guk era. “I pay a lot of attention to my grandchildren these days. That is why I teach the second and third generations to pray about such contents every morning and evening. ‘Heavenly Parent, thank you. I love you.’ (This is the most important part.) Shil Cheon Gung Haeng is to ‘practice the true love of the True Parents of Heaven, Earth and Humankind.’ ‘Shin-joon Moon will become a devoted grandson who will complete the dutiful way of a filial son, a patriot and a divine son in the family.’ For those in the second-generation: ‘[Your name] will become a second-generation member who will complete the dutiful way…’’ For third generation: ‘[Your name] will become a third-generation member who will…’ Just as I mentioned before, this is part of creating the environment. “In the beginning, God created the heavens and the Earth. Following this, He created Adam and Eve; God conversed directly with Adam and Eve after their creation. This is before the Fall. Our culture must be reborn through the Word, starting from the family. I had a meeting with elder leaders and lecturers a few days ago. Among those whom I met on that day, one leader from a Korean-Japanese couple had a young, ten-year-old child. Their family has difficult circumstances, but the son diligently reads the Divine Principle, Cheon Seong Gyeong or sermons. The child is still doing Hoon Dok Hwe even now. This Hoon Dok Hwe somehow resolved the difficulties within his family. I am saying for you to realize that great works have been conducted by the spiritual world since Father’s ascension. That means we all have the conditions needed to make everything possible. However, if you ask why you are not successful, I would say the reason lies within your personal problems. All of you here today must set up the heavenly tradition through this meeting today. You must lead lives of attending True Parents at all times. I am sure you know your companies’ performance will depend on how absolutely you attend True Parents in your lives. If you live for the sake of others through absolute faith, absolute love and absolute obedience, Heaven will greatly bless you. Do you understand? 2020년에 하나님의 조국인 이 한국을 하늘 앞에 봉헌해 드리겠다고 선포했어요. 그러기 위해서는 여러분들의 적극적인 책임과 협조가 있어야 돼요. 협회 조직을 보게 될 때에 몸 마음으로 비유할 수 있어요. 교회 조직은 마음에 속한다면 이런 기업체 기관 조직은 몸에 해당돼요. 마음 몸은 떨어질 수 없어요. 하나가 되어야 돼요. 그렇죠? 그래서 협회 조직과 재단 조직은 하나가 되어야 돼요. 그리고 몸이 건강해야 돼요. 몸이 건강해서 일을 열심히 해서 책임을 다해서 마음이 하고자 하는 일에 적극 협조해야 돼요. 그래야지 건강한 몸 마음 가진 개체, 교회, 또 사회, 나라, 세계가 되는 거예요. 그런 의미에서 여러분들에게 최선을 다할 수 있는 기회를 주려고 그래요. 2020이 되기 전에 제일 내가 먼저 하고 싶은 것은 부모님 생애박물관을 짓고 싶어요. 그렇게 2천년이라는 역사를 통해서 기다리고 기다렸던 재림 메시아를 맞았어요, 못 맞았어요? 이제 얼마 안 가서 그들도 알게 될 거예요. 이제 과거에 그런 모습과 그런 교리로써는 더 이상 발전할 수 없다 하는 것을 알게 될 거예요. 우리 통일교회는 아버님 성화를 놓고 볼 때 이 엄청난 6천년간 인류가 고대했고 하늘이 고대했던 한날을 맞았음에도 불구하고 구세주 메시아 재림주 참부모님이 이 땅에서 많은 섭리역사를 펼쳐 나오셨는데 너무너무 우리들이 부족해서 세상에 다 알리지 못했어요. 그것이 너무도 한스러운 거야. 우리가 책임을 못하게 되면 우리 후손들이 힘들어지는 것은 당연한 거예요. 그렇기 때문에 우리가, 1세들 여러분들이 살아 있는 동안 어떻게 해서든지 새로운 시대가 열렸고 기다리고 고대하던 재림주 메시아 참부모님이 왔다 가신 것을 알려야 돼요. 벌써 성화하신지 6개월이 지났는데, 그동안 여러분들은 맡은 책임을 놓고 얼마나 생명을 찾는데 노력했나요? 여러분들도 살아온 생애보다는 이제 앞으로 저 세상에 갈 그런 시간이 짧죠. 지금 오늘날 세계 인류는 70억이야. 70억이 더 될 거예요. 우리와 같은 시대에 살고 있었던 그들이 참부모도 모르고 이 말씀도 모르고 영계에 가게 될 때 얼마나 통곡을 할 거예요. “왜 당신이 살았을 때에 나도 있었는데 왜 나에게 이것을 알리지 않았느냐?” 이런 참소를 면할 길이 없어요. 여러분들이 책임을 못하게 되면 여러분들의 후손을 통해서 탕감이라는 것이 있게 돼요. 대부분이 축복가정이고 말씀을 다 들어서 알겠지만 여러분들이 책임 해야 돼요. 그래서 내가 2020년에 한국뿐만 아니라 세계적으로 적어도 43개국은 복귀할 수 있는 나라로 세우자. 그렇게 선정하고 박차를 가해서 나가고 있어요. 그런 데에 여러분들이 다 동참했으면 좋겠어요. 현상 유지 가지고는 안 돼요. 여러분들의 정성과 지혜와 모든 것을 다 투입해서 어떻게 해서든지 여러분들이 책임하고 있는 기업을 하늘의 은사 기간에 완성해야 돼요. 그래서 이 뜻에 기여할 수 있는 기업체들이 되어야 돼요. 부부가 하나 되어 가지고 물론 전도해야 돼요. 그리고 책임 다해서 회사도 발전시켜야 돼요. 우리는 이제는 성공해야 되는 것, 그 길만이 우리와 우리 후손이 나아갈 수 있는 길이야. 그것 잊지 말아요. 알겠어요? 「예.」그래서 아버님 생애 박물관도 여러분들이 다 동참해야 될 거예요. 역사박물관이 되는 거예요. 세계에서 둘도 없는 최고의 수준의 작품으로 나타내야 돼요. 모든 인류가 와서 보고 참부모님의 삶과 역사와 인류를 얼마나 품고자 하셨는가 하는 것을 생생하게 볼 수 있게끔 만들 거예요. 유피 아카데미를 만든 목적을 여러분들이 알 거예요. 150년 전에 인도의 시성 타고르가 한국을 찬양했어요. 그 사람이 무엇을 보고 무엇을 느껴서 그렇게 말했을까? 진리의 등불이 켜지는 날에 세계의 빛이 된다고 말했어요. 그 분은 하늘의 섭리를 알았던 거예요. 한국이 참주인, 재림메시아가 오셔서 그분으로 말미암아 한국이 빛을 발하게 되지, 한국 역사 자랑할 것이 무엇이 있나? 여러분들이 이 시대에 참부모님을 모시고 출발했다는 것이 정말로 여러분들의 후손에게는, 여러분들의 조상들에게는 크나큰 축복이에요. 은사예요. 이것을 받아서 자기만 가지고 있어서는 안돼요. 위하는 삶을 살아야 돼요. 나로 말미암아 내 이웃이 평화롭고 행복하고…. 이것을 넓혀 나가야 돼요. 요즘에 내가 손주들에게 관심이 많아요. 그래서 축복 2세나 3세에 게 매일 아침저녁으로 이러한 내용으로 기도해라 하는 것을 교육하고 있어요. “하늘 부모님 감사합니다. 사랑합니다.” 이게 첫 번째에요. “천지인 참부모님의 참사랑을 실천하는”, 실천궁행이지요. “효자 충신 성자의 도리를 다 하는”, 우리 집에 있어서는 “효손 문신준이 되겠습니다.” 축복 2세는 “축복가정 2세 아무개가 되겠습니다.” “3세 아무개가 되겠습니다.” 이것은 아까도 말했듯이 환경창조예요. 태초에 하나님께서 천지창조를 하시고 아담 해와를 창조하셨을 때 아담 해와는 하나님과 일문일답 통했어요. 타락하기 전 이야기에요. 우리의 문화가 이제 이렇게 가정에서부터 말씀으로 거듭나야 돼요. 엊그제 내가 원로 책임자들과 순회사들 모임이 있었는데 그 분 중에 한 사람이 한·일 가정인데 어려운 가정이었는데 그 자녀가 열 살인가 그렇게 어린 나이인데 원리강론이나 천성경이나 말씀 훈독을 그렇게 열심히 했대요. 지금도 계속하고 있대요. 그랬더니 자기들도 모르게 모든 환경이 정리가 됐다는 거예요. 이 말을 왜 하는가 하면 이렇게 지금 아버님 성화 이후에 영계에서 지상에서 놀라운 역사가 벌어지고 있는 것을 여러분들이 실감했으면 좋겠어요. 우리에게 모든 가능할 수 있는 여건은 다 가지고 있어요. 그런데 왜 성공 못하느냐. 여러분 개인이 문제에요.